For years, the economic policies of the People’s Republic of China have caused shock waves throughout Europe and North America, as the Chinese significantly undervalued their currency to give themselves an unfair trading advantage, according to the United States and the International Monetary Fund. Now, it seems, the tables have finally turned. 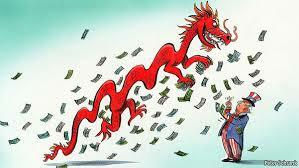 According to the Wall Street Journal, the International Monetary Fund on May 26, 2015 stated that the Chinese no longer had a strategic advantage with their currency, having risen in value to the point that it no longer gave them buying power over Western manufacturers. This is good news for North American factory workers, but probably not so much for companies like Wal-Mart that depend on cheap Chinese crap to boost their bottom line. ...American flags – $3.2 million worth of American flags were imported by the U.S. in 2010, with the vast majority being made in China, the Washington Post reports. This free-fall of the American economy can be traced back to 2001, when China was officially invited to join the World Trade Organization, with President Bill Clinton pushing hard for it. After they joined later that year, however, the Chinese government almost immediately began practices that were considered hostile to the West – using their new membership in the W.T.O. to give them a new superpower financial status. 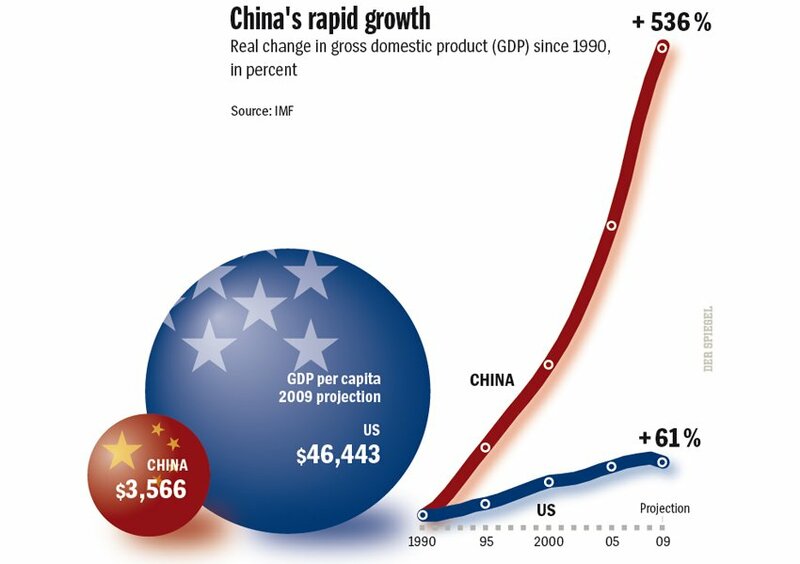 In 2001, China’s contribution to the world economy was 13%, making it the 6th largest economy in the world. By 2008, they contributed 20%, jumping to the 3rd largest economy. By 2010, it had overtaken Japan to become the world’s 2nd largest economy, only challenged by the United States. In 2001, China’s foreign trade volume was $509.8 billion. By 2008, it had arisen to a staggering (perhaps even an internationally suffocating) $2.571 trillion – nearly 5 times greater. 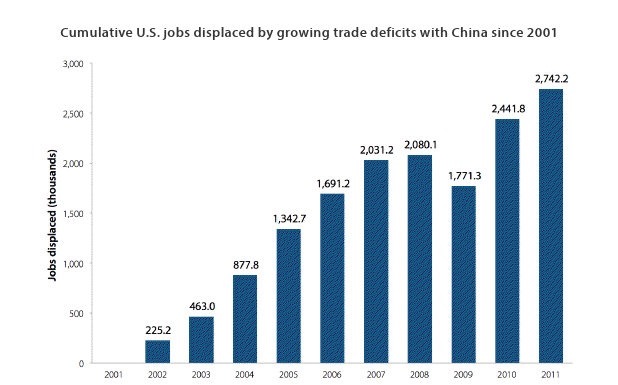 The Economic Policy Institute (EPI), a left-leaning economic think tank in Washington, D.C., estimates that America lost 2.7 million jobs as a result of the U.S.-China trade deficit between 2001 and 2011, 2.1 million of them in manufacturing. Wages of American workers have also suffered due to the competition with cheap Chinese labor, EPI says. A typical two-earner household loses around $2,500 per year from this dynamic. According to U.S. News and World Report, jobs were lost in all 50 states, as well as the District of Columbia and Puerto Rico, though the biggest losses were in: California (475,000 jobs), Texas (240,000 jobs) and New York (nearly 159,000). 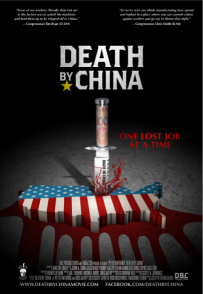 Peter Navarro, author the famed best selling book and subsequent award-winning documentary Death by China, paints an even bleaker, more destructive effect: he states that since China started flooding the U.S. market with illegally subsidized goods in 2001, 50,000 American factories have disappeared, 25 million Americans can’t find a “decent job”, and the U.S. now owes at least $3 trillion of its national debt directly to China. Fast forward to June 2015 – and suddenly it seems, the bully who stole everyone else’s lunch money is the one begging in the street! After their manipulative games on the world stage, I’ll be honest and admit I smiled when I read that their Shanghai Composite stock market – the second largest in the world – over the last 3 weeks has tumbled by more than 32%, shedding an astronomical $3.25 trillion of value – and nothing they do to stem the tide seems to help. To put it in perspective, that amount is equivalent to France’s entire stock exchange valuation, or 60% of Japan’s. In 2012, Greece’s government had the largest sovereign debt default in history. Greece became the first developed country to fail to make an International Monetary Fund loan repayment on June 30, 2015. At that time, Greece’s government had debts of €323 billion. We have all heard since that this amount threatened to cripple Europe, even cause the expulsion of Greece from the euro. In recent days, a bailout compromise has been reached, but not without the fury of the Greek voters, betrayed by their own Prime Minister into very deep austerity measures. However, what has happened in the last 3 weeks in China would be the equivalent value of 13 Greek loan defaults. If the Chinese didn’t already have the 2nd largest economy on earth, this would have easily destroyed them beyond repair. This past week, on July 8, alone, the Shanghai Composite closed down over 5.9% – losing a value of over $500 billion. And this came even after Directors of corporations were told that they could not sell company stock for six months. As reported by Reuters, on July 8 alone, more than 500 China-listed firms also announced trading halts on the Shanghai and Shenzhen exchanges, taking total suspensions to about 1,300 companies out of the 2,700 listed on the Shanghai Composite. Those companies represent 45 percent of the market or roughly $2.4 trillion worth of stock – as companies scuttled to sit out the carnage. The West should do absolutely NOTHING about it. Our own stock exchanges in fact had done rather well – the New York Exchange actually gaining about 500 points during this same period. Possibly, the market is reacting to the good news that some of these Chinese companies have been hindered or even crippled by this reversal – companies that were not only direct competitors of United States counterparts, but some have also been accused of stealing corporate secrets from their American rivals. The scale of international theft of American intellectual property (IP) is unprecedented—hundreds of billions of dollars per year, on the order of the size of U.S. exports to Asia. The effects of this theft are twofold. The first is the tremendous loss of revenue and reward for those who made the inventions or who have purchased licenses to provide goods and services based on them, as well as of the jobs associated with those losses. American companies of all sizes are victimized. 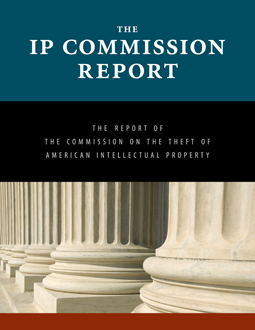 The second and even more pernicious effect is that illegal theft of intellectual property is undermining both the means and the incentive for entrepreneurs to innovate, which will slow the development of new inventions and industries that can further expand the world economy and continue to raise the prosperity and quality of life for everyone. 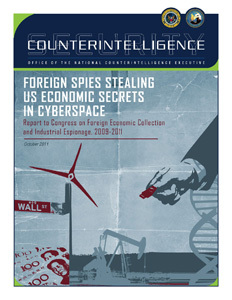 Chinese actors are the world’s most active and persistent perpetrators of economic espionage. US private sector firms and cybersecurity specialists have reported an onslaught of computer network intrusions that have originated in China, but the IC cannot confirm who was responsible. To be blunt, let’s get real – China is not our friend, she is not some innocent trading partner. China is the antithesis of everything we stand for in a democratic, capitalistic society. She is our enemy – a communist dictatorship that led America into, and then fought against her indirectly, during both the Korean and the Vietnam Wars. China has not “changed her tune”, she isn’t “turning over a new leaf”. China isn’t “born again”, nor has she “transformed” into a democratic nor capitalistic nation. 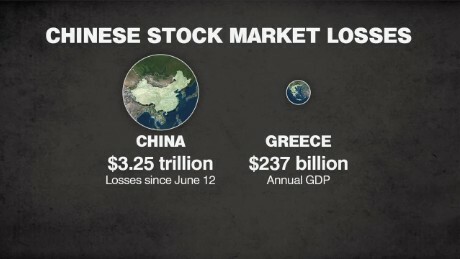 Here’s the bottom line – China appears to have averted a stock market crash. The Great Depression II may be awhile off now. But they aren’t out of the woods yet. And maybe, this could be a blessing in disguise for American workers, who want …who NEED to see companies bring jobs back to their shores again. For example, what effect does the Chinese downturn have on U.S. giant Apple, maker of iconic products like the iPad, iPhone, iPod, Apple TV, iMac and so many more? Apple sources most of its materials and makes most of its products in China – but it also now has factories in France, England, Korea – even Inner Mongolia, according to a very interesting infographic produced by Entrepreneur magazine. It no longer puts all of its….apples…in one basket. 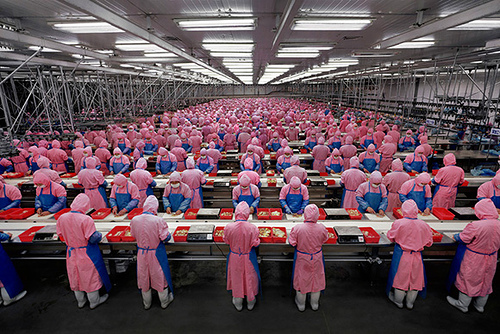 China relies on Apple more – in fact, through its manufacturing partner Foxconn, Apple is now the largest employer in China, with 1.09 million staff. And things have not gone so smoothly with operations there. Apple recently learned the hard way that working conditions in China are not ideal – when 14 staff members at a Foxconn factory staged a mass suicide in 2010, overwhelmed with the workload and horrible conditions. Apple is also now worth over $700 billion, making it the largest company in world history. It made a profit in the last quarter alone of $18 billion, more than 327 of the S&P 500 put together, and the most ever in the 74-year history of Standard & Poors – after recording sales of 74.5 million new iPhones. In an article recently in Forbes magazine, it was theorized that the computer and telephone giant could survive – possibly even thrive again – without Chinese involvement whatsoever in the company. Forbes estimates that it would cost the company $4.2 billion to move manufacturing back to the United States. Yah, ok, that’s not cheap – but it’s also not even 1/4 … of one quarter’s worth of profit in the past 12 months. And once it’s done, it’s done – most of those estimated costs are not repetitive. According to Entrepreneur magazine, over the long time, the cost difference for an iPhone would be possibly an additional $2-3 (not $203) if they returned the manufacturing back to America. Apple announced on May it is moving manufacturing of at least some of its iPhones to the Philippines from China. Good for them. But even better, Corporate America – it’s time to bring those jobs back home. It’s time that consumers tell these companies that we’ve had enough. For every Chinese guy making something today, that’s one less manufacturing job in North America, plus several less jobs supporting it – restaurants, grocery stores, gas stations, etc. And who makes up that lost tax base for your schools, hospitals, etc.? China clearly can’t even control their own economy right now – why are they also responsible for controlling ours? There is a very powerful and ever-growing truth that threatens the very framework and foundations of the People’s Republic of China – so powerful that the government doesn’t want the people within China to even hear about it. The government has managed to even ensure that this truth is not accessible to any of its 1.3 billion people, and that not one webpage with this information has been viewed in the country. Yet this powerful liberating truth HAS been heard anyway, spread word of mouth across the country. And as of July 2016, 243 million people have acted on this truth, and it’s changed their life forever. Next PostIslam Greetings BEFORE Islamic Gunman?